Another garden-heavy Muffin Tin Monday here! I used our very first tomato to make grilled cheese (love!). Pierce also had a cucumber/carrot salad (with a seahorse pick), home cooked green beans, and cherries (these were not from the garden - I only wish we had cherries!). He really liked everything and ate pretty well. I would share the cucumber/carrot marinated salad recipe, only it wasn't that great. It was one of my "creations". This one needs more work to be share-worthy! You can find more ideas for cute kids' lunches at Muffin Tin Monday. Please enter my giveaway for fun beauty supplies here! Looks like a good/fun lunch! I love, love, love grilled cheese!!! It's feel good food. I'll bet that tomato tasted amazing in there! These always look so great! I agree grilled cheese is just one of those foods that makes you feel good!! I fixed one of your muffins tin lunches to Ben.. He looked at it and said "This looks so good GranAnnie".. He ate it all ~! You are amazing all the things you do with your children especially these Muffin Tins..
Grilled cheese with a fresh tomato would be awesome! I love this meal. This looks like a fun and healthy MTM! You know I've never had tomato with my grilled cheese. I always just do grilled cheese plain with pickles on the side. Love your muffin tin idea, I am sending this to my daughter and daughter-in-law, for all of our little ones...Thanks for sharing!! This looks great to me! We're still waiting to get our first tomatoes. But, I think I'll still make some grilled cheese for lunch today. 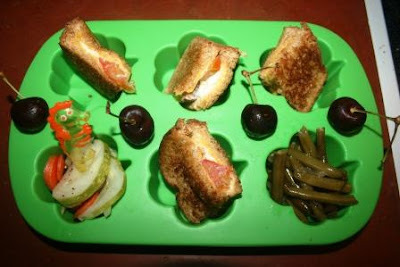 The grilled cheese with fresh garden tomatoes is making me hungry and reminding me that I haven't eaten yet today!!! Yum! Fresh garden tomatoes!!! Ours are almost ready! What a delicious lunch you made! I have missed seeing these. Your creativity amazes me! I'm going to have to try this - putting fun things in a fun muffin tin! Mmmmm, grilled cheese with fresh tomato! I totally envy your creativity! My poor daughter gets the same thing almost every day. I can't wait for our tomaties to be ready. If they can survive the heat, that is. Another cute lunch with all my favs! Don't know if you have ever heard of watermelon rind pickles - they are sweet and delicious...anyway, I bought a cookbook once that had a handwritten note by an elderly lady. It said that when she was little, her mom would let her and her brother take the watermelon rind and use cookie cutters to cut out cute designs for the pickles! Maybe you can use this tip some time! Whoohoo i am just happy to see some Cheese! hehe! I'll have to have my daughter check this out. She has alittle guy that only likes peanut butter and jelly and oatmeal! She's always looking for new ideas to intice him! Gotta love garden fresh!!!! Glad your little one likes good, healthy food. I love me some grilled cheese! I've done the bacon but never with tomato. I'll have to go pick one out of the garden to try this tonight!